Most of us often associate and confuse the term ‘physical activity’ with ‘exercise. WHO defines physical activity as “any bodily movement produced by skeletal muscles, which requires energy expenditure”. So, moving around to make your daily cup of tea, running some errands, walking your pet, and going up and down the stairs can be broadly classified as ‘physical activities’. But, most of us still lead a sedentary lifestyle. Because we’re confined to our workstations, glued to our mobiles, or sunk in the comfort of our couch, we seldom get up and get moving. Add to this other lifestyle choices such as hogging on junk food, eating at the work desk, putting off work for later, and you’ll know exactly where the problem exists. The lack of movement and lifestyle issues can potentially wreak havoc in the long term, giving rise to diseases that one wouldn’t anticipate otherwise. These include muscle degeneration, osteoporosis, weight gain, diabetes type 2, and cardiovascular diseases. Living a sedentary lifestyle can even increases the risk of getting cancer. The mere thought of these diseases and disorders is enough to put you at wit’s end. This is when you know that you need to go back to the start. Taking a leaf out of the book of Ayurveda can be fruitful in this direction. Increase Variation in Your Diet – One of the major mistakes that we commit when living a sedentary lifestyle is avoiding a balanced diet and eating only to satiate food cravings. However, as per a basic Ayurvedic principle, the human body is made from a combination of three doshas – Vata, Pitta and Kapha. To bring about a balance in these doshas, you need to include variety in your diet. Balancing Vata – Have warm, nourishing and, preferably, freshly prepared meals. These may include soups, stews or one-pot meals. Include sweet, salty and sour tastes in the food and try to avoid heavy food preparations. Also, select food that is naturally sweet and steer clear of food high in added sugar or artificial sweeteners. Balancing Pitta – Foods that cool down the system belong to the Pitta diet. Include lots of fresh salads, fruits and other cooling foods in your diet. At the same time, avoid foods like caffeine and alcohol that heat up your system. Bitter, and sweet tastes are also said to balance Pitta dosha. Balancing Kapha – To balance the Kapha dosha, warm, light and freshly-prepared meals are highly recommended. The tastes that balance Kapha include bitter and pungent. Fall into a Routine – A disrupted routine combined with unhealthy habits bring several lifestyle diseases to the forefront. It is difficult, but not entirely impossible to follow a healthy routine and let go of those habits.Fix your sleeping, waking and eating times, take breaks when necessary, and actively indulge in hobbies and other engagements that refresh your mind. Doing this not only wards off diseases and disorders, but also adds to your productivity. Regular Cleansing – Ever felt way too tired without even lifting a finger? Apart from various reasons, this can be the result of toxic accumulation in your body. As important as it is to implement a diet plan to balance your doshas, it is equally vital to opt for regular cleansing or ‘detoxifying’ your system.Without a detox plan, it becomes difficult for the body to eliminate toxins, the buildup of which, turns the body into a house of diseases. The immunity of the body also diminishes and you become more vulnerable to common cold, cough, flu and allergies.Abhyanga or Ayurvedic self-massage with products that utilize the goodness of pure Ayurveda, is one of the ways to eliminate toxins from your body. You can also opt for Udvartana for the same purpose. Drinking warm water throughout the day also helps flush out excess toxins. Watching what you eat and eating simple is another way to reduce toxin buildup in the body. Practice Yoga Every Day – Don’t have the time for gym sessions? Why not embrace the magic of Yoga in that case? A simple form of exercise, it can effectively increase your physical activity and offer several other benefits. For instance, it can aid digestion, help you de-stress, tone the body, and boost your fitness levels. You can also combine meditation with yoga to reap more advantages. Leaving your sedentary lifestyle behind is a feat that is impossible to achieve in a day. 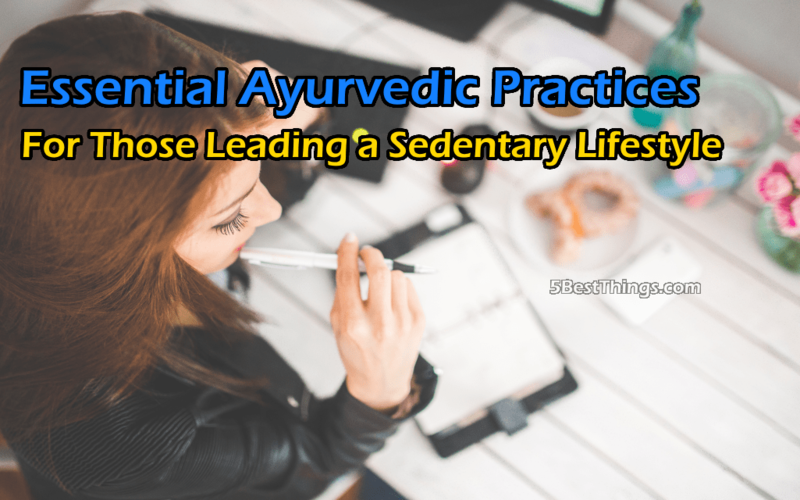 But, it is possible to include the above Ayurvedic practices in your routine and feel the difference they make in the long term. Axara Sharma is a content writer. She writes on several topics, which include lifestyle and healthcare. She extensively writes about hair loss, ayurveda and herbal remedies for IRAYA. Apart from the written word, she loves the outdoors and being a foodie!